From illuminated manuscripts to graphic novels, illustrations have always had a place with books. One way this occurs is with hidden fore-edge paintings. This is the practice of decorating the fore-edge (the opposite of the spine) of a book with an image that can only be seen if the pages are fanned a certain way. A royal bookbinder named Samuel Mearne is credited with being the first person to hide an image this way during the mid-17th century. According to legend, a friend of King Charles II of England would frequently borrow the King’s books and claim them as her own. Mearne and Charles conspired to hide the King’s coat-of-arms on a book before lending it to this dishonest friend. When the friend denied Charles’ ownership of the book, he fanned the pages out to reveal his symbol. As the Romantic idea of the “picturesque” became popular for landscape painters, bookbinders began to include such scenes on the fore-edges of books. The landscapes chosen would correspond to the subject of the text. The popularity of hidden fore-edge painting waned until an influential bookbinder named William Edwards of Halifax revived it in the late 18th century. 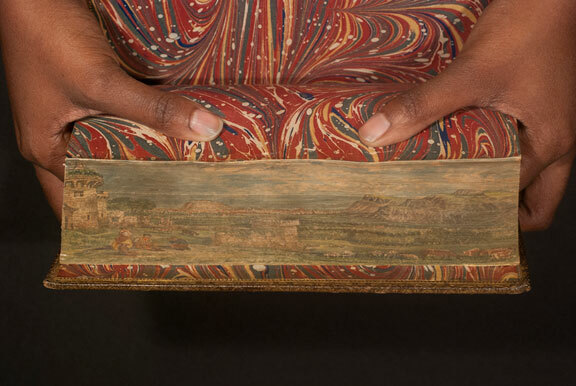 Hidden fore-edge painting is created by clamping the fanned out pages of a book. The artist will then use watercolors to paint the desired image on the fore-edge. After the paint dries, the clamp is released and the edges of the book are gilded. Some modern-day artists will purchase old books that are already gilded and put hidden paintings on them. At Special Collections we have four books with hidden fore-edge paintings. A History of British Reptiles by Thomas Bell was published in 1839. The book is illustrated throughout with woodblock print images of various reptiles. 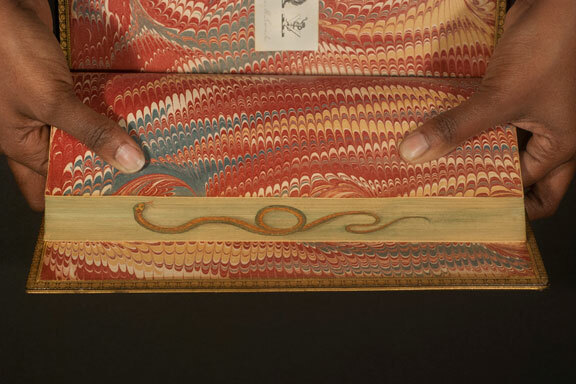 Hidden in the fore-edge is a colorful painting of a snake. We also have a series titled Minstrelsy of the Scottish Border: Consisting of Historical and Romantic Ballads, Collected in the Southern Counties of Scotland; With a Few of Modern Date, Founded Upon Local Tradition. This is a collection of Scottish folk songs collected by Walter Scott in 1806. According to an inscription from a previous owner, the painting on Volume 1 depicts Gilnockie Tower, home of Johnnie Armstrong. Johnnie Armstrong (also Johnie Armstrang) was a Scottish Border reiver, or plunderer, who was executed by James V. His tale became one of the ballads transcribed by Bell. Volume 2 has a street scene featuring the home of John Knox of Edinburgh. Knox was a key player in Scotland’s Protestant Reformation during the 16th century. The fore-edge painting on Volume three is a landscape scene. An inscription from a previous owner notes that a portion of Craigmillar Castle, a medieval structure located in Edinburgh. To see the books for yourself, visit Special Collections in room 104 of the Albin O. Kuhn Library. Monday through Friday from 1:00pm to 4:00pm. On Thursdays we are open until 8:00pm. 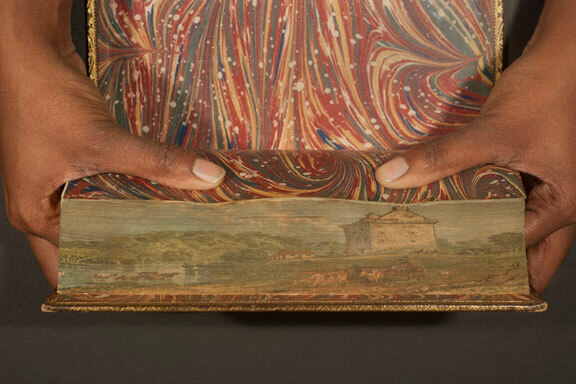 For more examples of hidden fore-edge painting, visit the Boston Public Library’s website on the topic http://foreedge.bpl.org/. Dutter, Vera E. "The Ancient Art of Fore-Edge Painting." American Artist 33.1 (1969): 56-57, 62. Print. 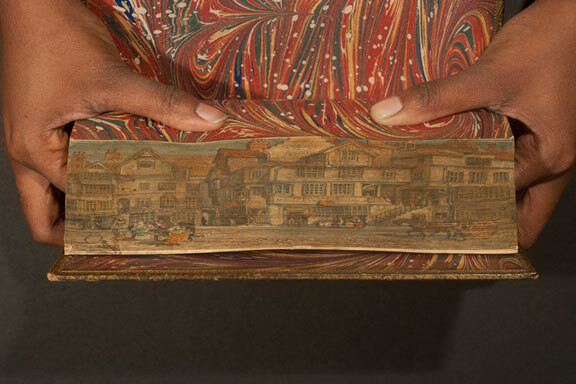 Weber, Carl J. Fore-edge Painting: a historical survey of a curious art in book decoration. Irvington-on-Hudson, N.Y.: Harvey House, 1966. Print.